As the new year begun, we can say that many people’s resolutions had something to do with helping our planet be cleaner. One way of doing this is installing green energy plants instead of consuming conventional energy. As for solar panels, the plan is not so bad, but there are some climates in which people doubt they are any good, thee snowy ones. Because of this matter, researchers wonder if solar technology is useful in wintry climates. So they started a project to find out, but this project could affect the energy costs for every homeowner that uses solar energy, but it will mostly affect the ones that rely entirely on solar power and are not connected to the grid. But the majority of residences that are on the grid have minimal financial impacts but the energy losses still rise questions to enhance optimal usage. 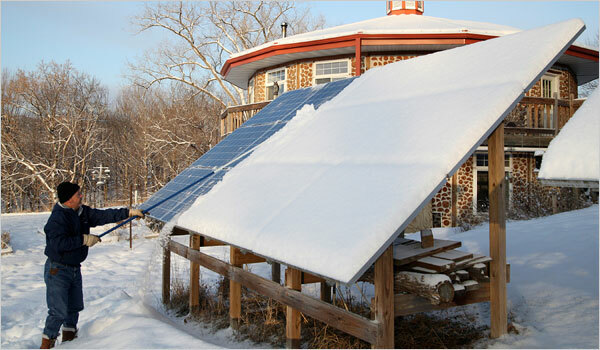 Researches run by MTU and the engineering firm DNV GL Michigan, Colorado and Washington by MTU tests the energy output for solar panels with different levels of snow and the accumulation of snow at the bottom of the panel. At the end of the study, Pearce believes that, solar panel designers among with the people that are funding systems and everyday homeowners will be able to find out the snow caused losses.